Billa is a remake of Billa (Tamil) which is a remake of an earlier Rajnikanth film of the same name which is a remake of the Amitabh Bachchan classic Don (Salim-Javed are credited for the original story). I’ve seen all of them, plus the more recent Hindi Don starring Shah Rukh, so I didn’t expect the unexpected and largely this is faithful to those predecessors. Meher Ramesh adheres to Telugu film conventions requiring happy endings and righteous heroes so there are a few changes. I enjoyed the total disregard of inconvenient logic and budgetary challenges. It is a modern, slick film with a dash of B movie and the spirit of making do for the sake of entertainment. Prabhas plays the title role of Billa – a gangster with a puzzling penchant for black satin and three piece suits. In the tropics. No wonder he was always so irritable. The chafing must have been a nightmare. Billa works for ‘Devil’ and seems to be a model employee. He is out to eliminate the competition and stay ahead of the law while selling arms, drugs and who knows what else to villains all over South-East Asia. He lives a luxurious lifestyle on his private island where he continues to overdress for the beach. He is a cranky intolerant man, and Prabhas does well to be so unlikeable and dour. I did like Billa’s catchphrase ‘Trust no one. Kill anyone. Be only one”. It was a bit reminiscent of Highlander. The English dialogues were often very funny though I am not sure the level of cliché was intended. The subtitle team made their mark too. Prabhas also plays Ranga – a naive thief and layabout who has a heart of gold. Ranga is Billa’s duplicate and when Billa is out of circulation, the police use Ranga to infiltrate the gang. This role is a better fit for Prabhas as his likeable goofy side is given more rein and he is more expressive. Ranga is sympathetic without being overly complex. Prabhas gets an opportunity to play up the confusion as Ranga impersonates Billa but his characterisations are so broad that there is no ambiguity at all. Ranga has a far more colourful inner life than Billa, so that allowed for some variation in the song treatments. Subbaraju makes an all too short appearance as Vikram, the gang member who tries to leave Billa for love. Once I realised he was marked for death I was a bit sad. But I cheered up when Hansika (his love interest) was hit by a truck. Seriously – casting Hansika for the role requiring a seductive dance? What were they thinking? Her costumes don’t help; a floor length evening dress (for clubbing, of course) is replaced with cut-off denim shorts and an oversized jumper. It was all quite daft and compared to Helen … well. Say no more. Vikram’s sister Maya (Anushka) goes undercover to avenge her brother and his flattened fiancée. Anushka is not exactly wasted in this role but despite being a strong personality, Maya is not all that integral to the action. The swimming pool has a more important role as it is the means of getting the heroines into their skimpiest outfits. Maya vies with Lisa (Namitha) for Billa’s attention and there is more chemistry, albeit toxic, between the ladies than there is with the hero. I liked that Lisa was allowed to fight to get rid of her competition, and surprised to see that her repertoire included a fencing bout. The action scenes by Stun Siva (what a great name!) are a blend of impressive fight choreography and some quite lame stunts. I could see the inspiration for a few scenes was directly lifted from Farhan Akhtar’s Don (2006) but it felt as though they got to the location, realised they didn’t have the budget or know-how and just went for it anyway. 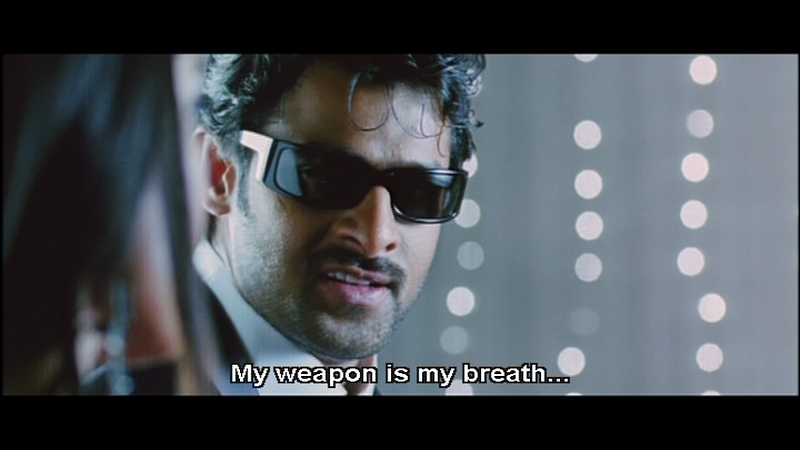 Prabhas seemed much more at home in the high adrenalin action scenes than with the dialogues he was given as Billa. The action scenes are sometimes quite creative. Every good hero/anti-hero needs a good villain and Kelly Dorjee’s character Rashid is flamboyant and slightly unhinged. Krishnamraju (Prabhas’ uncle) is the dedicated policeman after Billa, and gives a nicely balanced performance. Adithya is a cop under suspicion of collaborating with the baddies and is effective and understated. Rehman is Dharmendra, the Interpol agent in charge of hunting down Billa. The supporting gang members are a mixed bag, including Supreet as Ranjith, Billa’s 2IC. Ali has a significant role that is not a comedy distraction. He is a good character actor so I wish he would do more roles that contribute to the story instead of distracting from it. The music by Mani Sharma is disappointing despite being closely linked to the drama. It was all quite uninspired and only the performers and costumes made any of the picturisations very memorable. Anushka isn’t a very enthusiastic or accomplished dancer so I found the work-arounds in this clip quite amusing. The costume designers had a fine time and the look developed for Billa and gang was quite consistent and fitted the overall visual flavour. Namitha and Anushka seemed to have clothes designed by a 20 year old boy with raging hormones but they wore it all well. I have to say that if I am to be afflicted with half naked skanks swanning around, it is nice to see more curvy and natural shapes than a stick insect with implants. But was it necessary? What do you think. To be fair, there was a lot of shirtless Prabhas on display so there was almost equal opportunity for eye candy regardless of your interest. Quite apart from the endless parade of shiny suits, I lost count of the montages of sour-faced Billa flexing and/or staring enigmatically. I found Billa very entertaining. I pretty much knew where the story was going, but I liked the spirited and fast paced dash through all the shenanigans. Prabhas is in good form, the support cast do well with their material and the film looks great. It was a fun timepass and watching it again recently, I enjoyed it all over again. 3 ½ stars! Heather says: Faran Aktar’s Don is one of my favourite Hindi films which may be one of the reasons why I couldn’t appreciate this Telugu version. The opening scenes where Billa does his stuff as the king-pin of the drug organisation were painful to watch as the actors indulged in some of the most stilted acting and dialogue delivery that I’ve ever seen. Billa’s English phrases, in particular his ‘Can, can’ were dreadful and made him sound like a total idiot, while it was hard to watch Prabhas impersonate a chunk of wood when he’s normally a much better actor. It wasn’t just the terrible direction in this section that didn’t work for me, since the stunts and effects were just as bad. It appeared as if Meher Ramesh thought that a film about gangsters needed plenty of fast cars, helicopters and motorbikes, which I agree is not a bad idea, but then couldn’t work out how to use them in the story. So we ended up with completely implausible situations which seemed contrived just so that another over the top stunt could be stuck into the screenplay. And for goodness sake, if Billa was trying to escape in a Ferrari there is no way that anyone would have been able to keep up! Plus it’s not exactly the best car for an unobtrusive getaway, but I guess that really wasn’t the point. Thank heavens for Subbaraju who did help me get through the first few scenes, along with Hansika as a comedy side-plot, since I couldn’t do anything but laugh at her character. The film picked up immensely once Prabhas was allowed to exert his natural charm as Ranga, and despite the continuing forays into pointless special effects it was much more entertaining. I enjoyed Ali’s role for a change, and Anuskha and the other supporting actors were all good enough to keep their characters interesting. I just wish Billa had been less of an escapee from a Goth fashion parade (clichéd model personality included) and more of a vicious but possibly more interesting killer. 2 ½ stars. This entry was posted in Tollywood and tagged Adithya, Ali, Anushka, Anushka Shetty, Billa (Telugu), Hansika Motwani, Kelly Dorjee, Krishnamraju, Mani Sharma, Meher Ramesh, Namitha, Prabhas, Rehman, Stun Siva, Subbaraju, Supreet, Telugu, Tollywood. Bookmark the permalink. The filmmakers do get extra points for sticking Prabhas in various hot tubs and swimming pools. For the “Don” completists, I also recommend tracking down “Yugandhar”, the original Telugu remake, starring NTR. He was probably a little out of the range to play the character, but it was pretty delightful. Hi Temple, I am enjoying your take on the ‘clothes maketh the man’ theory – it gives much food for thought. If it is the satin outfit and chafing that makes Billa irritable, perhaps we should look at investigating this theory further. I am thinking that perhaps it may have been the sheer low cut/ fluorescent shirts and scarves that made Sonu Sood batshit crazy and evil in a so many of his movies. And perhaps Mahesh is only a baby faced killer because he is overheated and irritable from wearing all those layers. Also, and I know I may regret asking this, but when Billa says ‘I use women and weapon in the same way’, what way was that exactly? The clothes were very entertaining and I do admire Prabhas’ fortitude in paying the price of style. Sonu Sood could have been driven round the bend by any one of his outfits in Ek Niranjan, let alone the massed assault of shiny shirts and lairy trousers. Perhaps this could form the basis of your next research paper? Especially if it requires a deepdive into the multi layered world of Mahesh. And regarding your reluctant query, it is never really explained. Billa goes on to say ‘there is risk and kick to both’ which is still faintly disturbing. Especially considering he was in the bath. With a gun. I laughed so hard at “My weapon is my breath.” The power of translation.